Welcome to Cape Cod Rails! Cape Cod Rails uses frames. Your web browser doesn't support frames (or if you're using Internet Explorer you have frame viewing off--go to Preferences under Edit and then Web Content and check Show Frames). The following is the non frames version of Cape Cod Rails. If you have the choice, I reccomend viewing with frames turned on, as the information below may not be as up to date as the information contained in the frames version. 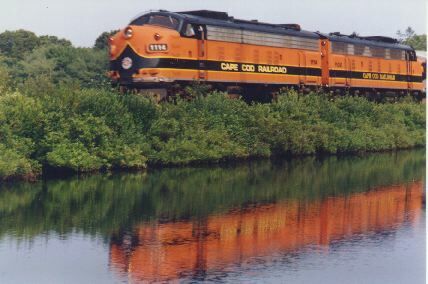 This website is devoted to my love of trains, especially on and around Cape Cod Massachusetts. However I'm certainly not limiting the content of my website to the railroads near the Cape. As you'll see below in the directory, there is the Pennsylvania railroading section. There's also a page of photos at South Station, Boston. Please bookmark my site, and stop by again! I hope you enjoy my website, and please feel free to e-mail me any comments or questions that you have. I'd love to hear from you! Please, explore! Cape Cod Railroad F10 #'s 1114 and 1100 heading North on the Cape Main through East Sandwich. If you support full funding for Amtrak, let your legislators know. Send them a letter or an e-mail. You can also let the world know by copying this ribbon and posting it on your website. This website created with Netscape Composer 4.05 for Macintosh.